Fifth grade – and the song I can’t get out of my head is “I Think I Love You.” Every girl at Griffith Elementary School – make it every girl at schools around the United States – feels the same way. How we swooned over David Cassidy, the teen idol who played a made-for-TV band’s lead singer. The fictional band was The Partridge Family, based loosely on the real-life Cowsills, a family pop band popular in the late ’60s. The TV show debuted in fall 1970, just a month after “I Think I Love You” had been released as a single. The show featured Shirley Jones as a widowed mother of five children, who scheme to put together a band as a way of helping the family financially. Amazingly enough, this unknown family band has its debut at Caesar’s Palace in Las Vegas! Jones’s real-life stepson, David Cassidy, played Keith, the oldest of Shirley Partridge’s children. Susan Dey, Danny Bonaduce, and two younger children rounded out the family cast. Like many girls my age, I tuned in every Friday night to The Partridge Family. In fact, it was the first show my family watched when we got our first color TV. We were watching Shirley Partridge and her kids, when the camera zoomed in for a very tight close-up of Shirley Jones’s face, complete with bright orange – nearly neon orange – lipstick. What a thing to see on a color set! My younger brother exclaimed, “Look at them lips!” And with that the TV sparked and went dead. No more Partridge Family. We have laughed ever since about those technicolor lips of Shirley Jones. Although the actors “performed” songs as part of the show, most of them were actually lip-syncing. The only actors who performed in the band were David Cassidy, as lead singer, and Shirley Jones, who sang backup. So the 45s and albums that my friends and I purchased with our allowance money didn’t actually feature Susan Dey and Danny Bonaduce, but instead were the product of an anonymous studio band. This made no difference to us – for it was David Cassidy we wanted, and he was there front and center. Though fifth-grade girls could not have known – yet – that pressing, anxious, heart-stopping feeling you get when you are falling in love but haven’t yet “confessed” that love, we nevertheless gladly sang along. Of course, like every school girl, I dreamed that Keith/David was singing that song to me. That was the magic of the song: this cute, cute heartthrob seemed to be confessing his love to me – and I loved him right back. Unbelievably, “I Think I Love You” – a song by a fictitious band – hit #1 on the Billboard charts. Since 1970, there have been many cover versions, including those by Andy Williams, Perry Como, Paul Westerberg, and David’s daughter Katie Cassidy. David Cassidy himself recorded an updated solo version in 2003. To go behind the scenes with the Partridge Family, check out Shirley Jones’s 2014 memoir or one of David Cassidy’s two books: C’mon, Get Happy: Fear and Loathing on the Partridge Family Bus and Could It Be Forever? My Story . You might want to visit David Cassidy’s official website. To get the original version of “I Think I Love You,” you can buy the group’s first album, simply titled The Partridge Family Album . The complete TV series is available on DVD . I’m under no illusion that The Partridge Family was great television or that the music released under their moniker was any good. But I can say that I still know every single word to “I Think I Love You” and that I am willing to belt it out if ever I am asked. My fifth-grade self would be proud. Image Credit: 1974 portrait of David Cassidy taken by Allan Warren. Used with permission. https://commons.wikimedia.org/wiki/File:David_Cassidy_Allan_Warren.jpg. This is especially poignant for me this week as I think about so many memories that took place in my parents’ living room. My cousins and I were just reminiscing about these same Friday nights! I love revisiting my childhood– tweens– with your reminiscing! Thank you! I think I still have the “45” and maybe the partridge family Xmas album. I would be honored to sing I think I love you along with you and dreaming about 20 something David Cassidy! Yep, The Brady Bunch and The Partridge Family were the highlights of Friday night! Thanks for the reminders! 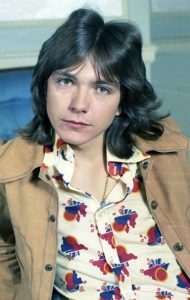 Funny how David Cassidy looks so young, when I thought he was so grown up!